What will I be using my deck for? If you plan to use your deck for entertaining, is it large enough to accommodate your guests? If it is near a pool, hot tub or wet area you probably want decking that isn't slippery. If your deck will be used primarily for rest and relaxation is there adequate shade and or sun? 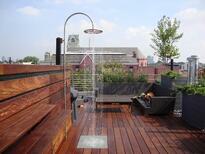 In this rooftop deck, Ipe decking was selected due to its rich natural character and natural slip-resistant qualities. How do I define what is beautiful? Do you like the look of all natural real wood or are you OK with plastics and other synthetic decking materials? Many decking products look very appealing when they are new. How long will they look beautiful and what you may have to do to keep them looking beautiful become the next questions you wish to consider. 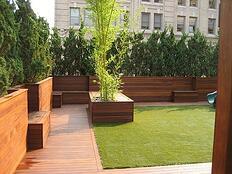 The all natural Garapa decking pictured below was chosen for its warm tones and natural color and grain variations. These are all considerations when selecting the right wood decking. Regardless of which decking material you choose, an annual cleaning is absolutely necessary to keep your deck or porch looking fresh and free of dirt, mold and mildew. 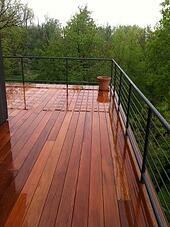 Softwood decking requires an annual coating of either stain, sealer or paint or it will decay and decompose rapidly. While synthetic products claim to be "maintenance free" or "lower maintenance" the truth is that the colors fade rather quickly. 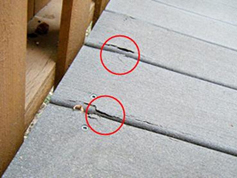 Composite decking has also been known to decompose and degrade quickly as well. Mataverde Premium Decking weathers beautifully on its own, or seal once annually to maintain its naturally warm wood tones. How long do I want my deck to last? If you want to build a deck once and enjoy it for many years without replacing the deck boards, you'll need to choose a long lasting decking material. That rules out nearly all softwoods and composite decking products. Plastic decking has only been on the market for a few years so nobody knows how long it will last. Will it fade, scratch or "ugly out" before it wears out? High density hardwood decking is the only product that has proven to last for 25 years and much longer. Mataverde Ipe decking was chosen for the deck and planters below because of its natural resistance to decay and rot. How much money should I spend on my decking? Depending on how much you have budgeted your deck project, there are decking material options for most budgets. An outdoor deck increases the living space of your home significantly. A beautiful, well constructed deck will add enjoyment for you and value to your home. An important point to consider is that the decking you choose will only represent about 25% of the overall project yet it is the most visible focal point of your finished project. Your choice for decking material is the part that everyone will see. Go ahead... live a little.